Pumpkin Avocado Tostadas are a fun fall snack or weeknight dinner! Topped with chile pumpkin spread, sliced avocado & lime. Healthy, vegan & gluten-free. 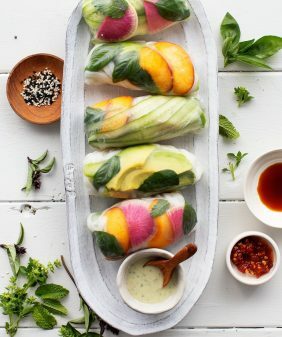 “They” say you should eat an apple a day – but according to everyone’s Instagram feeds these days, I think we can all agree that the almighty avocado is the way to go. I don’t care if they’re trendy or not, the good fat that you get from avocados always makes for a delicious, nutrient-dense meal or mid-day snack. In an effort not to show you yet another version of avocado toast – I have the next best thing – the avocado tostada. It’s like avocado toast in disguise. I baked organic corn tortillas until crispy, layered them with an ancho chile pumpkin spread and topped them with crispy veggies, slices of Hass avocado, and a few pinches of sea salt. If you’ve been following for long, then you understand my serious love for avocados. 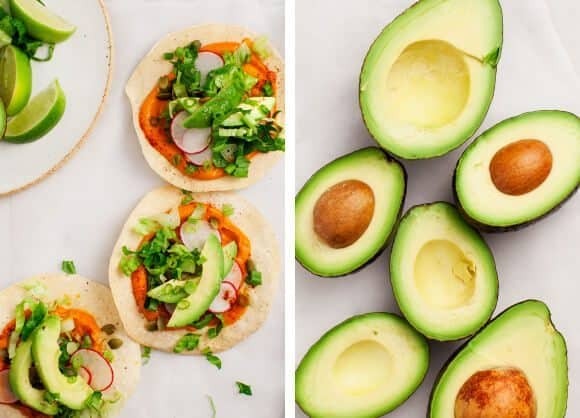 When I’m trying to avoid saturated fats, I sub in avocado instead of butter on my toast, or instead of cheese on my tacos… you get the idea (and if you don’t here are 61 other instances). Today, we’re working with the The Hass Avocado Board to help spread the message that diets rich in fibrous foods (like avocados) potentially reduce the risk of type 2 diabetes. Make the ancho chile pumpkin spread: Preheat the oven to 400°F and line a baking sheet with parchment paper. Slice a small pumpkin in half and scrape out the seeds and pulp. Bake for 1 hour, or until fork-tender. 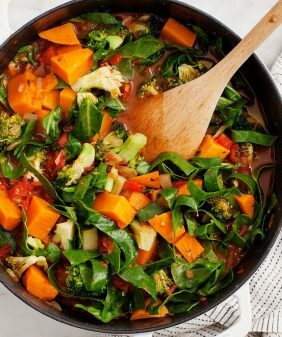 If using a sweet potato, bake for 35 to 45 minutes. Let cool. Scoop out 1 cup of the pumpkin flesh and place it in a blender or food processor with the olive oil, apple cider vinegar, garlic, chile powder, chipotle paste, cumin, coriander, and a pinch of salt and pepper. Add water as necessary to blend to a smooth consistency. Adjust spices to taste. Chill until ready to use. Preheat the oven to 350°F and line a baking sheet with parchment paper. Place the tortillas on the baking sheet and bake until crispy, about 15 minutes. 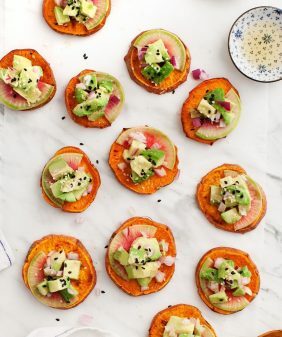 Assemble the tostadas with the pumpkin spread, lettuce, avocado slices, radish, scallions, and pepitas. Top with a pinch of sea salt and a squeeze of lime. Serve with extra lime slices, salsa, and hot sauce, if desired. Store extra pumpkin spread in the fridge for 3 to 5 days. Top it on tacos, serve with quesadillas, or use it as a dip for chips. **The water is necessary if you’re using a blender. You will probably need less water if you’re using a food processor. You can also mash this by hand and skip the water. This post was created in partnership with the The Hass Avocado Board. HAB has joined the American Diabetes Association® in the national Stop Diabetes® movement. Their goal is to help increase awareness about the role that good fats play in daily nutrition. Wow this looks so beautiful – really delicious and perfect for this season – so thank you for the recipe!! Well this looks like all of my favorite things combined. Tostadas, chipotle paste, avocados, pumpkin, and vegetarian. Will be trying this ASAP! Oh, this looks like one of my favorite quick meals- a black bean and sweet potato tostada topped with avocado. Yum. This looks absolutely lovely! 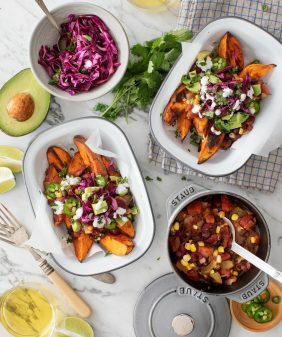 I’ve tried a sweet potato and cauliflower version similar to this and loved it – have to add this to my must-make list! Yes avocado is definitely the new apple! I love the ancho chili pumpkin flavor combo here. I’ve been making a similar tostada but will definitely add the chipotle and apple cider vinegar next time. Do you think plain ol’ pumpkin puree from a can would work? If, say, I had a cup in my fridge that needed using ASAP? Did you make that lovely chili verde sauce in the picture. I’m wondering how to make that. 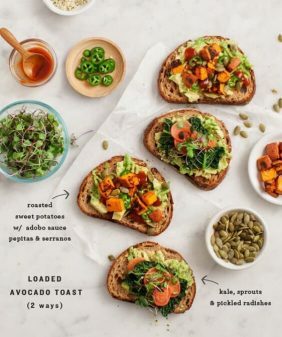 OMG, why have I never put pumpkin with avo? I have to try these gorgeous tacos!!! These look amazing! I need to add these to my meal plan for next week! I have been eating an avocado a day for years. 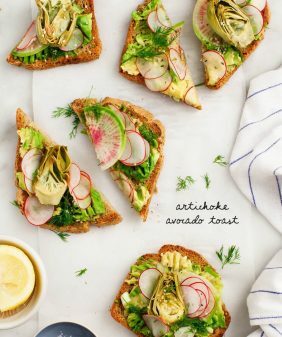 Avo toast is my favorite meal when I only have a minute, but a crunchy tostada may just have to be my new favorite. Thanks for the idea. These were great, and wait to use the filling with other recipes! I have to admit, I’d never considered using pumpkin in anything besides desserts. I consider myself a pumpkin lover, so I definitely need to give this a try! This sounds delicious, I can’t wait to try it out! 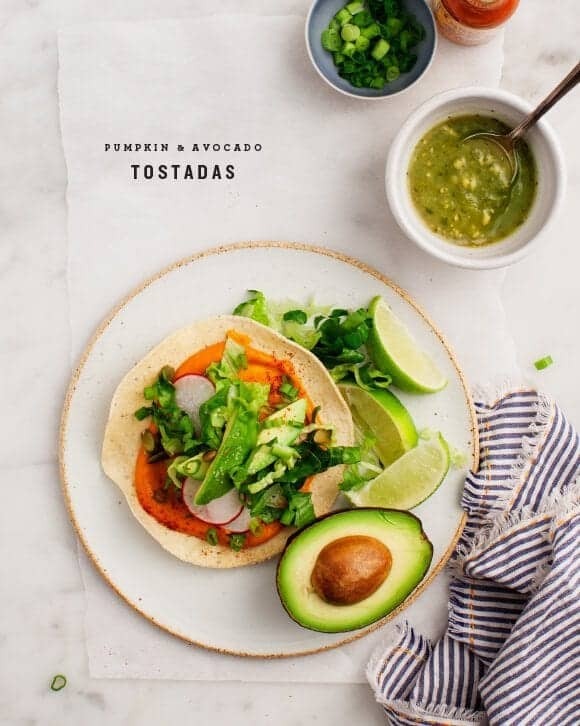 I would’ve never thought to use pumpkin in tacos, especially paired with avocado. It looks and sounds so yummy and healthy. I’m excited!